After climbing the slope where she had left tracks. WHOA! I can see this as a cover for a sci-fi novel. Very effective! I love this! Striking lighting, fantastic use of the grays to frame -- really stunning! @juliedduncan Thanks a lot, Julie, too nice of you! @365projectltaylor hehehe - thank you! @taffy Thank you so much, Taffy! I do really appreciate! @allie912 Thank you very much, Allison! @seattlite Thank you very much indeed, Gloria! Marvellous. The desert suits minimalism so well. You found just the right light for this. looks like a film shot! I love this, and I adore how you manage to tell a story with a little light and shadow. Great minimalism. This is great! Looks like a still from a movie I’d wanna see. @helenhall Thank you very much. 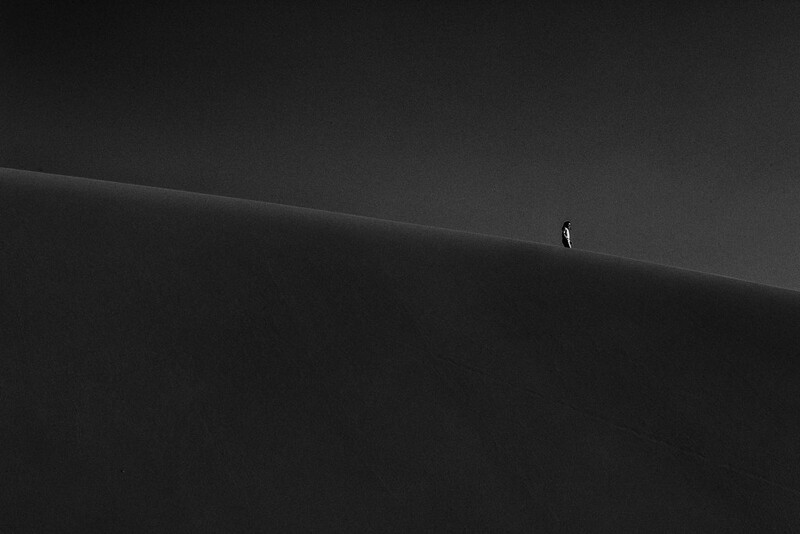 I do agree on the desert=minimalism equation. More to follow! @pistache Thank you a lot! @craigwantsnack Thank you a lot! Big compliment! Wonderful, wonderful, wonderful! What a photo - perfect title as well. Kudos, my friend! @kerosene Thank you so much, my friend! It's ten years, but it looks still so fresh to my eyes! What a superb almost surreal image - you at your best. Love this photo! Less is certainly more! This is fantastic! Such wonderfully dark minimalism! That's a perfect title! Definite fav here. Just nothing short of completely brilliant! Powerful! Fav. @leonbuys83 thank you very much! @vignouse you know how much I appreciate your judgement- thank you! @bentmarinos thank you so much! @northy I’m humbled, madam. Thank you! @fauxtography365 thank you very much! @stray_shooter thank you, Sir! Much appreciated! @joysabin too kind of you, Joy, thanks a lot! @golftragic thank you so much! Minimalism at its best! Love it! Nicely seen, photographed and processed. Great image. @bella_ss thank you a lot! i love shots like this, reminding us that we are just a speck in the overall schemes of things. great shot, DD. aces! @summerfield Thank you so much, Vikki, much appreciated! @haskar Thank you a lot! Love the composition and the use of the light. @yaorenliu Thank you very much, Yao! @yrhenwr And thank you again. Your comment made me laugh! A toast (pun intended) to you! I love everything about this -- the composition, the lighting, the solitude evoked by the scene, it's fantastic!